Typing your flight details into the flight price comparison and booking engine on the left and booking the cheapest airfare. Using SouthAfrica.TO travel vouchers to discount your flight. If you haven't got any yet, then join the tribe of people who have sent us writeups of their trips, and we've sent travel vouchers in return (everybody gets). Start with emailing us a review of your flight from Johannesburg to George. 15 Dec 2014: Majestic Air will be launching flights from Lanseria International Airport to George in near future. No dates have been confirmed yet. 6 Nov 2014 : FlySafair has heeded the call of their clients and launched flights from Johannesburg to George. The airline will start flying to George from the 3rd of December 2014 with airfares starting at R499*. 18 Nov 2013 : Mango flights from Johannesburg to George are launched, with 3 a week. 2 Sep 2012 : SA Express Johannesburg - George flight frequency is increased from 20 to 24 a week. 31 May 2012 : A mother attempts to prevent her daughter from boarding a 1time flight from Johannesburg to George, by phoning the call centre and telling them there's a bomb on the plane. 18 Jan 2012 : British Airways ends flights between Johannesburg Lanseria and George. 1 Dec 2011 : British Airways commences daily flights from Johannesburg Lanseria Airport to George. The flights are scheduled to leave Johannesburg's Lanseria Airport at 10h10, and arrive in George at 12h55. The return flights are scheduled to leave George at 13h25, & in Johannesburg Lanseria at 16h00. Hard landing at George Airport, after flying from Johannesburg. 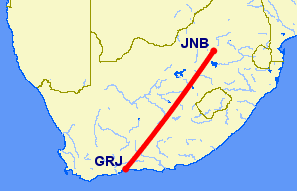 A direct non-stop flight from Johannesburg to George takes some 2 hours (depending on what type of plane you are flying on). The driving distance between Johannesburg and George is 1163km.